Chances are that come this Sunday, unless you have incredible willpower or a strange aversion (and then I just can't relate to you, sorry!) you will be ingesting some sort of chocolate. And even if for some reason you aren't eating it yourself, you'll probably be buying it for someone you love, spending far too much money on something you can easily make yourself. Yes, that's right--I said easily. What chocolate shops and candy makers don't want you to know is that you can turn these out in your kitchen in just a matter of minutes, and a little chilling time. Plus, you'll earn major points with your loved one due to the homemade factor. See, I'm always looking out for you guys!! A few years ago, I was at the mall with my kids and nieces and we passed by a chocolate shop where they were dipping fruit into chocolate right there in the window. Of course, we HAD to go in and I was all set to buy them each a chocolate covered strawberry when I realized that it was $6 per berry!! Can you believe it? Even my kids were kind of horrified and walked out (I think we went to a CVS and got Hershey Bars instead, lest you think I am the mean mom I am and deprived the little darlings of a treat!) Yikes!! But my point is that you can save scads of money and probably wind up with a better tasting outcome by making your own. There are really only three steps here: 1) You coat the berries in an easy-to-make chocolate ganache. 2) You chill them on wax paper in the fridge until the chocolate has hardened. 3) You shake them in a resealable bag full of unsweetened cocoa powder. That's it! You're a bona fide truffle maker! See what I mean about easy?!! Also, as far as treats go these are really not all that bad for you--a fresh berry loaded with antioxidants covered with more antioxidants in the delicious form of chocolate!! And as far as I'm concerned that's a bowlful of Valentine's love! Prep Time: 15 minutes, plus at least 1 hour of chilling time and about 5 more minutes to dust them in cocoa. 1. Line a rimmed baking sheet with waxed paper and set aside. 2. In a small heavy saucepan, over medium heat, bring the cream just to a simmer. Remove from the heat and stir in the chopped chocolate until smooth. If using add in the framboise and stir to combine. 3. Don't wash the berries but pat them dry with a paper towel if they seem wet. Add 8 berries to the chocolate in the saucepan and use a rubber spatula to gently coat them with the chocolate. Using 2 forks, remove the berries, one at a time, shifting from fork to fork to allow the excess chocolate to drip back into the pot and then place the covered berry on the prepared baking sheet. Repeat with the remaining berries. 4. Place the sheet into the refrigerator and chill for at least 1 hour, until the chocolate is firm. 5. Place the cocoa powder in a large resealable bag, unpeel the truffles from the wax paper and add them to the bag. Seal the bag, leaving some of the air in, and gently shake the bag to coat the truffles. 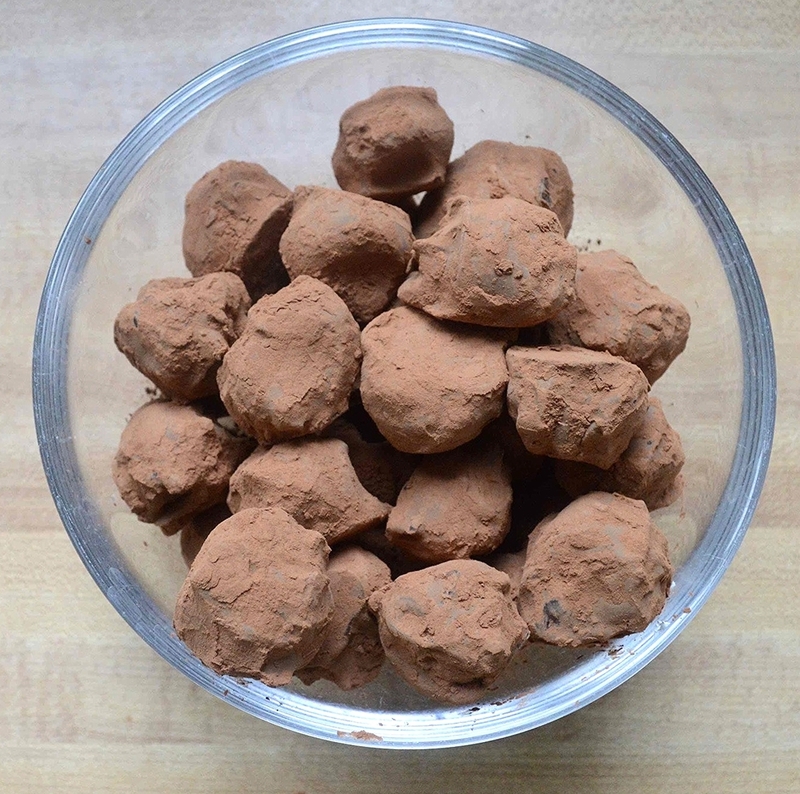 Remove the truffles one at a time and shake over the sink to get rid of any excess cocoa. Transfer to an airtight container and store in the refrigerator until ready to serve. 6. Truffles last at least a week covered in the refrigerator. Note: Recipe adapted from Epicurious.